What’s with the Sewers in Highlands? April 2013, when I brought up that ” our “flow” had not decreased since Sandy, and it should be a huge RED FLAG. What I got from the council was, Mayor Nolan “All the residents are still living in Highlands, just not in their homes” and that was why it was the same. Well, I’m not an engineer, however, any explanation that we could possibly have the same amount of flow before and after Sandy was illogical. So here’s the real story, we have failing pipes and infrastructure and even putting meters on residents/businesses isn’t going to change the fact ‘as a town’ we owe $x every month in waste treatment. However, I do find it a little unfair, that the businesses aren’t covering more of this expense than what they are. We can’t change the overall bill until certain aspects of the infrastructure is fixed, but we can sure as heck redivide up the bill to make it more fair across the board. So what do you think we should do about the Sewer situation in Highlands? Previous What Should Highlands Recovery Priorities Be? Next Do you plan to vote in May for Highlands Council? this is why the town was so eager to get rid of the ahhhr sewer authority. They didn’t want the authority bringing up all the time the issue of I and I. So now noone will know what’s going on until the ground caves in!!! Get rid of the current leadership. If they cant take the time to provide responses to questions or a plan to fix it, they serve no purpose. Your issue is valid Sick & Tired. Make sure you – and all Highlanders – get out and vote May 13th! Well, I don’t know, technically what to do about it but I know that I pay about 18:00 per month in water use and the sewerage use is minimal . You know this hasn’t been addressed , as far as I know , ever but it was talked about in the passed. The quarterly payment is way out of line. I would think that technology is much more efficient that it used to be and we had our own facility in the past…well I know the boards are supposed to do the thinking around here maybe they thought about that . I’m pretty sure you can get a copy of that I&I thing if you ask so… that’s about it It is time for this to happen if you ask me. What should we do? We should upgrade the system. In the mean time, maybe the town finds out what the average household usage is. Then bill the businesses the same flat fee that the residents pay for usage up to that average number and a per gallon charge above that. But then you get into the businesses either paying on the honor system or submitting their bills and a reconciliation for review. I’m surprised the Environmental Committee hasn’t been all over this and implementing ways to reduce I&I until we can fix the system. 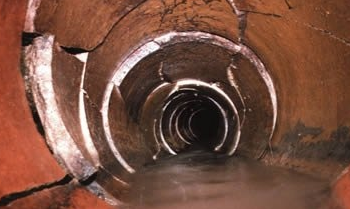 On another topic…when we finally get around to fixing the pipes, who pays for that? Does it come from the sewer authority (our sewer bills) or the town (our property tax bills)? Some council members want to lower our bill because they think we’re going to have greatly reduced costs. But if the sewer authority has bonds and will need to pay for the future upgrades, doesn’t it make sense to keep the bills at the same rate and use the surplus to pay down debt and/or finance the upgrades? Costs will only continue to rise if not fixed. I think we need to fix these problems instead of some of the things money is being spent on. Flooding & infrastructure important to any kind of growth. for the record when former Sewer Authority commissioner and former councilman John bentham beought these issues up at council meetings years ago he was ridiculed by both former councilmen johnny unbanski and billy caizza and the democrats who did not want to do anything about or address the issue. Much of the I and I comes from leaking laterals coming from peoperties to the mains. So do the math on why the don’t want to do anything about the problem!! Bentham was ridiculed BC he was ridiculous. That guy used to make up fake names then have conversations with his invisible friends. That guy bbentham needs to wipe the cheetos off his keyboard. I don’t think that there is a single council person past or present who takes Mr. Bentham’s comments seriously. The poor man was a running joke. Duncan you really shouldn’t pay much attention to his past commentary, it carries little weight. I am a little surprised that he didn’t try and run for a council seat . I heard he wasn’t well so maybe that explains his not taking up the torch. Angus … now and then I check out the Highlands Forum section on the http://www.ahherald.com website … and I noticed you and Chris were discussing these same sewer issues back in 2011. Then Sandy hit. BUT WHY HAS IT TAKEN UNTIL NOW IN 2014 FOR THESE KNOWN FACTS TO BE ADDERESSED? So it seems to me that Highlands is facing serious infrastructure repairs that don’t come cheap. We have the $4M bond to replace the pumps that were not maintained … but what will it take to restore the leaking and failed sewer lines? I noticed when Jk Reilly was replacing Gas pipes that they pumped out a load of water from underground and I feel our street is sinking which I mentioned in a council meeting. They also patched up streets in a way that water now has obstacles to get to drains. I fear it may require a major overhaul – especially since we have separated from the Atlantic Highlands partnership. The infrastructure is old and band-aids aren’t working anymore. Was this even listed on our FEMA Long Term recovery top 3 list? Or does the responsibility default to the sewer commission? Either way it is a taxpayer problem that needs qualified answers. Isn’t there legal things required on the running of sewerage over the years? I recall Atlantic Highlands had the same problem and they did something about it. The system is old too. Barbara – I seem to remember Chris Francy saying that the flood control efforts had three arms – and I&I was one of the projects. I could be wrong …..
You ask a good question. What are the top 3 priorities from that FEMA group? Back when I was on the council we started to repair and rehabilitate the sewer system.We obtained a grant from the ahhrsa and repaired basin 8.After that was complete we[the boro] began to investigate basin 2 for repair after I left this didn’t continue.The way it works is the town hires a company usually an engineering company to television inspect and smoke inspect the designated area and devise the best way to repair.Then the repair is put out for bids.After the repair is complete the lines are reinspected to verify the repair.After basin 8 was repaired the boro was going to repair the whole downtown basin by basin.Also new watertight sanitary manhole covers are installed this keeps the saltwater intrusion out during our full moon monthly events.It needs to be repaired,its going to cost a lot of money,but we have to fix it this is the only way we are going to be able to lower our sewer rates.The more time that goes by the more money we pay to pump clear water is poor use of money we could spend to fix the problem.Another thought on this matter is when we have new development we must make sure that they contribute money to upgrade the system so I can handle the capacity.One example might be when you replace 50 one bathroom mobile homes with sixty 2 and a half bath homes.It shouldn’t be a deterrent for new development just a cost which would benefit the owners by reducing rates.And as far as the 4 million dollar flood cost project I wouldnt move forward until whoever designed this could gaurantee a valve system at the end of our outfall lines that will stop high tide water from going past and flooding our streets and a maintainence program for flood to ensure that our money will be well spent. Lack of maintainence seems to be a major part of the problem and needs to be addressed.A simple tide clock tells you when a full moon tide is coming check the gates and turn on the pumps.Lets make sure we are spending 4 million dollars on a flood project that is actually going to stop the flooding if there are flaws address them now. And this is why I vote Johnny. He knows the problems and works for solutions and consensus. Every vote counts 🙂 !